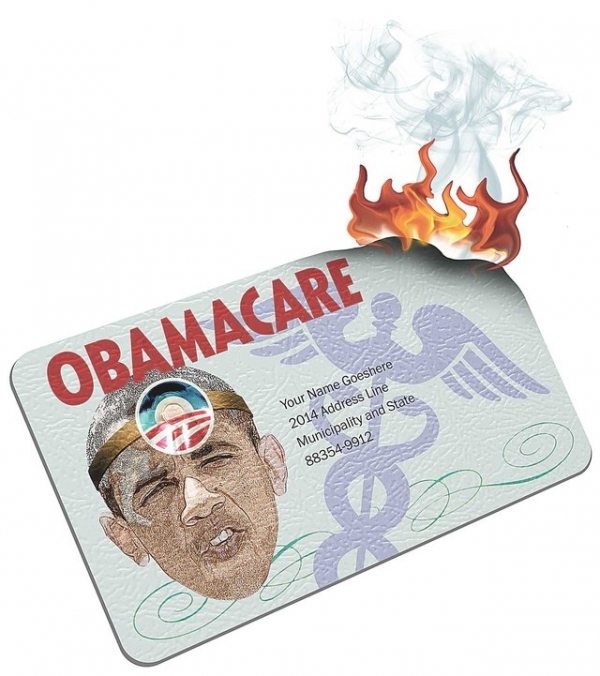 Starting six months from now, the individual mandate will take effect. Most Americans will be required to show proof of “acceptable” insurance coverage, as defined by Washington — in effect, a health care draft card. Like compulsory military service, the health care draft will conscript private citizens to carry out a national goal dictated by Washington, and the burden will fall especially hard on young people. If all of us, especially millennials, were to become health care draft resisters, we could hasten Obamacare’s inevitable collapse and pave the way for a patient-centered system. It’s not against the law to ignore the mandate or to buy coverage that doesn’t fully conform to the law’s myriad micromanaging rules. That’s right, we can resist the draft in good conscience, without risking jail time or significant fines. To learn how, read the full article here. OBAMA UN-CARE Law, will work the same as IRS. It will destory anybody strongly opposed to government control. It will destroy anybody that obtains too much wealth & power. Obama un-care, WILL kill off anybody that is part of any undesirable group. Gay, Tea Party, Black or White, christain or republican. The IRS has to be dissolved, destroyed or burned down. FEDERAL RESERVE, is next. Contrary to the popular myth, Republicans have offered several alternatives to Obamacare, all of which were rejected out of hand by Obama and his cronies - while all the time they were saying they'd listen to any alternatives the Republicans had to offer. Dr. Phil Roe (R-TN) is the Co-Chair of the GOP Doctors Caucus in the House of Representatives. Bloggers and activists from around the nation gathered at FreedomWorks this September 6-8 for a Defund ObamaCare Summit, where they discussed the consequences of ObamaCare and the strategies being used by Democrats and some Republicans to keep the law in place. Attendees at the summit learned to counter the most substantive arguments – many of which have been ironically formulated by Republican congressional leadership – to support the funding of ObamaCare. The message was simple: Why fund a law that no one believes will work with money the federal government doesn’t have? Washington insiders and politicians from both sides of the aisle have been on a media blitz across America insisting that defunding Obamacare is a complex issue and it's impossible. They are being less than truthful. ObamaCare funding can easily be eliminated if Congress refuses to pass a Continuing Resolution that funds any part of the bill. Fresh polling data released today by FreedomWorks reveals that Republicans face greater political danger if they vote to fund ObamaCare than if they stand on principle to defund it. House & Senate/Schedule: Both the House and Senate are back in business after five weeks. The House will be in session through the end of next week, September 20th and will then recess for a week. The Senate, meanwhile, will be in continuous session through October 11th. Apparently, House Republican leaders think we're stupid. House Speaker John Boehner (R-Ohio) and his leadership team are reportedly trying to pass a Continuing Resolution (CR) through the House this week that funds ObamaCare but looks like it defunds it. In every one of these situations: the push to attack Syria, the NSA spying on citizens, funding and implementation of Obamacare; proponents want to allow the government to do something it should not do, but claim we will be able to stop it if it goes any further. That thinking is backwards. The way to stop the NSA from gathering citizens' data, to keep the attack on Syria from escalating, and to stop Obamacare, is not to allow them to get started (funded) in the first place. Last week, we dove in the massive sea of the unseen implications of the Patient Protection and Affordable Care Act (Obamacare) for the labor market. Discussed was the growing concern that the paperwork burden of complying with the numerous regulations will waste literally hundreds of millions of man-hours as companies and agencies shift resources to push pencils. Key Vote NO on Any Continuing Resolution that Funds ObamaCareAs one of our millions of FreedomWorks members nationwide, I urge you to contact your representative and urge him or her to vote NO on the upcoming Continuing Resolution if it contains further funding for ObamaCare. FreedomWorks will score against any Continuing Resolution that contains funding for the further implementation or enforcement of ObamaCare, and may score any procedural vote towards that end.